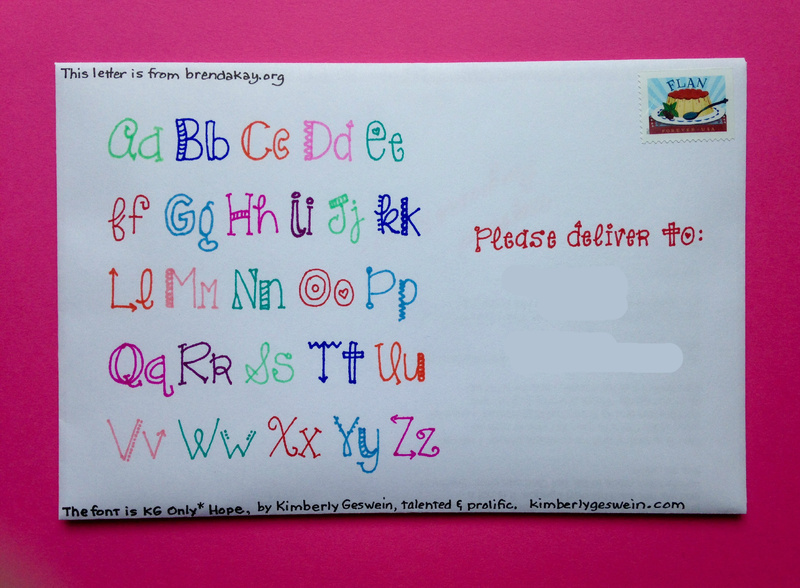 Today’s Envelope Art features the font KG Only* Hope by Kimberly Geswein. Kimberly is a very gifted and prolific font designer. I hope she has fun making fonts, because they are certainly fun to use. Thank you, Kimberly! Smiles–easy to give and easy to take. One day I was in line at Walmart behind a husky guy with a big gun on his belt. I was contemplating that gun and wondering what kind of guy he was. It was a bit intimidating. However, after he checked out, he turned around and flashed me a big smile! I was surprised and delighted. That smile changed my thoughts all around. Above as the art appears on the envelope, below, framed.